Contemporary, sophisticated LED lamp designs hand-made in the USA. Most designs can be modified to your specifications. All items ship FREE to the continental United States. New designs continually added. The “Twist” is hand-formed satin anodized aluminum set in a tiered base of 3/4″ unfinished clear pine. The light is pure white, high lumen output, with extremely low energy consumption and greater than 50,000 hours of life. The base can be stained or painted to your preference. Powered by 12V dc, complete with wall transformer and inline power and dimming touch switch. 4.5″ x 7″ x 20″, approx. “Infinity” is a minimalist, highly contemporary LED accent/table/night light. The LEDs are controlled with a radio frequency (RF) remote control, which allows you to control the white light brightness from anywhere in the room without the need to point the remote directly at the lamp, unlike infra red (IR) remotes. 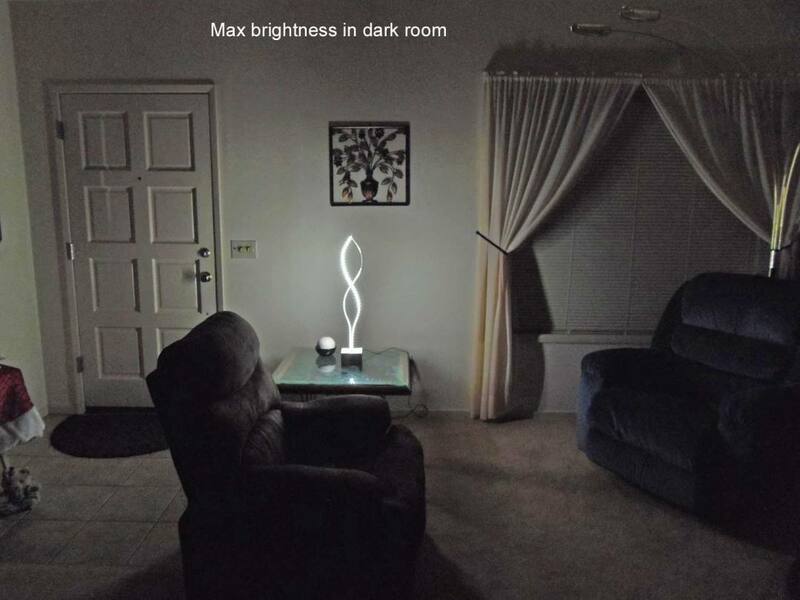 At maximum brightness, this lamp can illuminate an entire small room! “Elegance” is a polymer cement impregnated open weave fabric that serves as a table/accent lamp, or a dried floral arrangement vase. Finished with a multi-layered, bright copper metallic coating. The light source is an E27 LED bulb which operates on 110 line voltage, so no wall transformer is required. Bulb life is greater than 50,000 hours, does not get hot, is super energy efficient, and is easily replaceable. The inline on/off switch also allows for full dimming of the lamp. Very unique and stylish, my new “vase” lamps provide a new twist to accent lamps. Lace covered PETG is hand formed to create an opening flower-like shape. The “shade” is removable from the walnut stained wood base for easy cleaning. Powered by bright white LEDs, it features an inline on/off/dimmer touch switch with memory (the intensity setting is remembered when turned on after shutting off). The LEDs have a greater than 50,000 hour life span, and are easily replaceable. Comes complete with low voltage wall transformer. “Cobra” is a stylized LED neon flex accent/night light lamp. Complete with inline on/off/dimmer touch switch and low voltage wall transformer. Can be customized – email with your details. 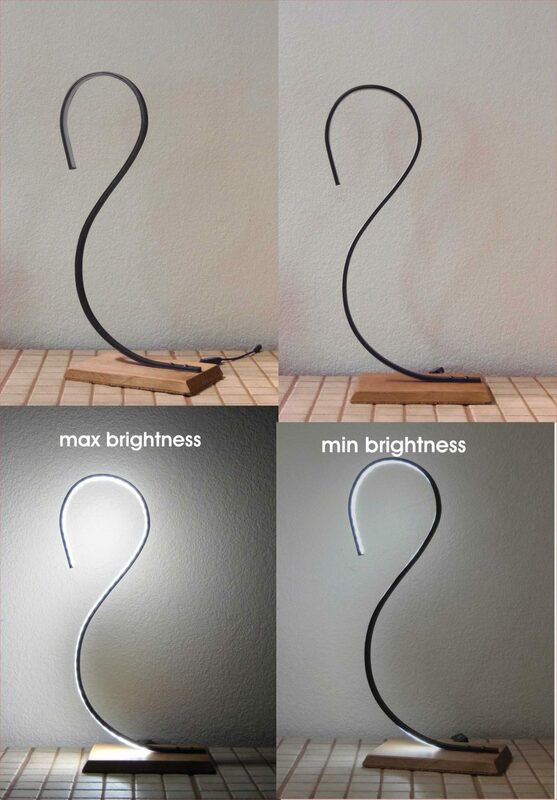 Gentle, sweeping aluminum curves define this hand-formed aluminum LED lamp. Features bright white, dimmable continuous LEDs with a life greater than 50,000 hours. The waterproof LEDs are “exposed” to complete the ultra- contemporary look. The base is triple-tiered 3/4″ unfinished clear pine, which can be painted or stained to your preference. Powered by low voltage 12v dc. Comes complete with wall transformer and inline touch on/off/dimmer switch. 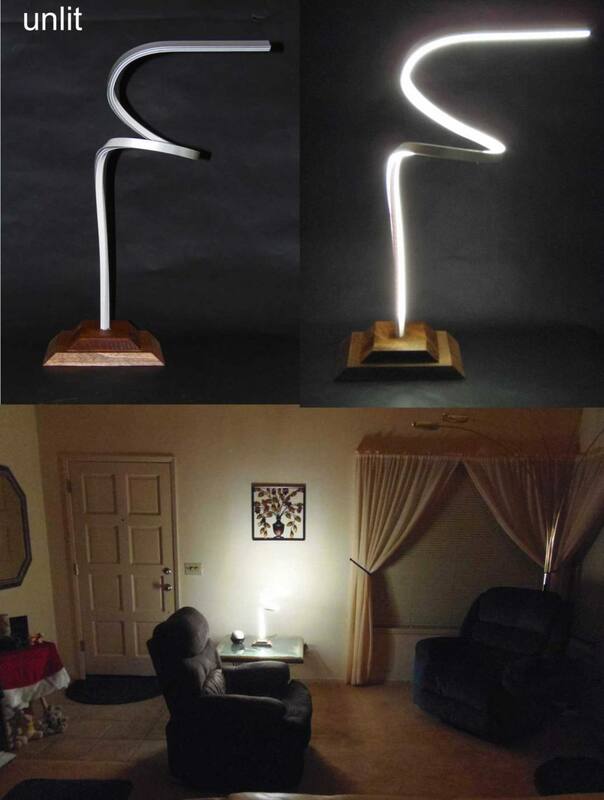 All-aluminum minimalist LED lamp can be used as a desk, table or accent lamp. The finish is satin anodized, with an inline on/off/variable dimmer touch switch. The “square peg in round hole” construction allows total flexibility of the light orientation without removing the base. You can also change the elevation of the lamp by sliding the base up or down. The LED color is cool white. The inline switch is all electronic: touch once for on/off, touch and hold for dimming function. 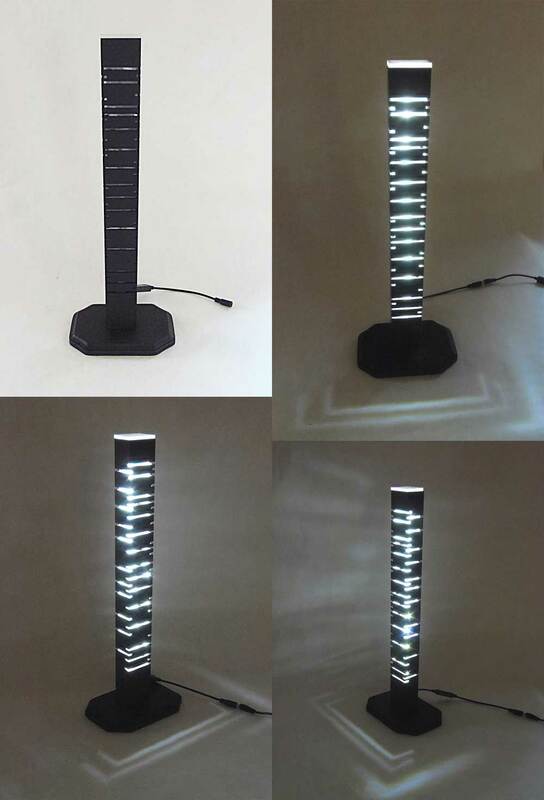 “City Lights” is an LED accent lamp designed as a stylistic representation of a skyscraper lit at night. Hand-cut in flat black aluminum, and mounted on a 3/4″ thick flat black pine base. Each of three sides of the aluminum column features a different cut pattern for a different view and wall “throw pattern”. A cloud lamp you can hang on the wall or hang from the ceiling?? YES to all of these options! This is not a “ball” of fibre fill glued to a paper lantern, but a wrap-around on a PETG base – there is no backside so it can be hung on a wall or suspended from the ceiling. My design features a full color range with the wireless remote control. Choice of battery or line power. Overall dimensions: 17″W x 12″H x 3.5″D, can be customized to your specs – contact me for details. Hand-formed aluminum, Black Swan is a minimalist, stylized interpretation. Bring a little love into your home with this led neon heart lamp. Mounted on 1/4″ clear acrylic, the LEDs are double-sided so you get the 3D effects as shown in the photo. The base is unfinished solid fir – leave it as is or finish with paint or stain of your choice. Lit photos are at max output. Lamp life is greater than 50,000 hours and is replaceable. Color is bright white or pink (your choice) and runs barely warm to the touch. The light may be too bright for a night light application, so an inline on/off/dimmer switch with memory is available as an option for a small upcharge. Complete with low voltage wall transformer and inline on/off switch. The special mounting allows for disassembly should any repairs be necessary. Modifications of dimensions and base finishes are available by quote. Mounted on 1/4″ clear acrylic, LED neon flex provides uniform lighting from BOTH the front and back sides, unlike LED strip lights with front surface illumination, and creates an infinity effect when viewed at an angle. Greater then 50,000 hours of life, with no decrease in light output. Complete with inline on/off/dimmer switch and wall transformer, this lamp is supplied with removable “feet” for table mounting, and two small top holes for mounting on a wall (use finishing nails). Dimensions: 8.5″w x 16″h, approx. Twist III is hand-formed satin anodized aluminum set in a triple-tiered base of 3/4″ unfinished clear pine. The light is pure white, high lumen output, with extremely low energy consumption and greater than 50,000 hours of life. The base can be stained or painted to your preference. The aluminum is a somewhat “springy” 1/16″ thick, which would allow you to change its shape if you wanted. Powered by 12V dc, complete with wall transformer and inline power and dimming touch switch. 4.5″ x 8.5″ x 22″, approx. A new use for an established product, this lamp features a 3/4″ thick unfinished clear pine framework, within which precision-angled LEDs provide a uniform light. The pleated shade is easily removed for cleaning and to allow you to paint or stain the frame to your preference without the need to mask. Unique to this design is the ability to detach the frame from the base and hang the lamp on a wall to create a new “window”. Powered by bright white LEDs, it features an inline on/off/dimmer touch switch with memory (the intensity setting is remembered when turned on after shutting off). The LEDs have a greater than 50,000 hour life span, and are easily replaceable. Copyright © Robert M. Tutone. No portion of this site may be reproduced by any means, for any purpose, without express permission.